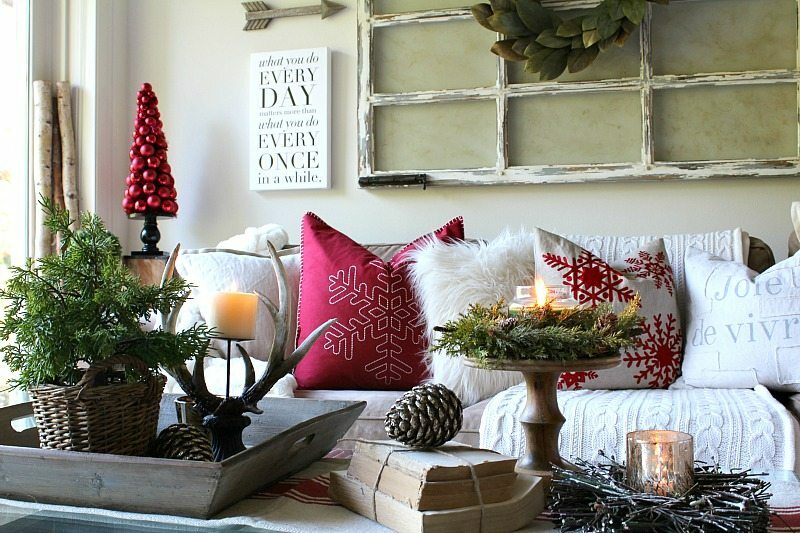 Welcome Friends, to our second Blog Hop Holiday Coffee Table Tour! Thank you to our incredible host Janine of Happy Happy Nester, for hosting our tour. If you arrived from Kathleen’s at Lindsay Hill Interiors a special welcome. Isn’t her style amazing? Well, Jodie and I are thrilled that you are here so let’s get decorating! Always begin with a theme. With the holidays soon approaching my theme is Christmas. Maybe yours is Thanksgiving if you are entertaining at your house this year. Other possible choices for themes are: spring, Easter, July 4th, winter, fall, etc. Maybe you’re throwing a party with a theme, like a baby shower, engagement party, or New Years Party. 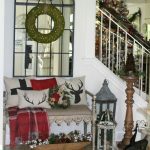 It doesn’t have to be a holiday or season but you will find this an easy way to begin to think about decorating. I like my home decor to reflect my mood and what’s current in my world. 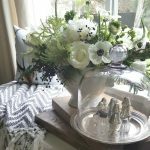 If you prefer not to change your coffee table entirely you can simply update with a few new items that convey the current theme. For example, let’s say you have a bowl, a tray and a stack of books regularly appearing on your table. 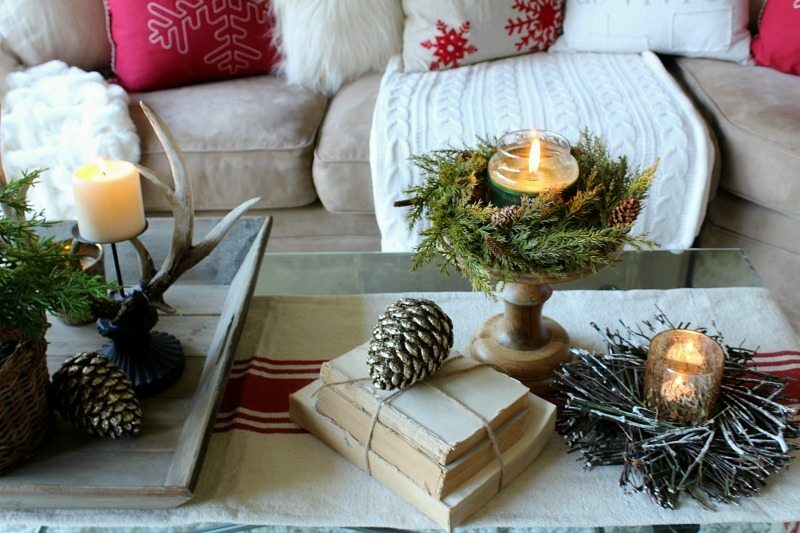 You can give your coffee table a fresh seasonal look by changing out a few of the details that appear in the bowl, on the tray, and possibly on top of your books. Your essential “building blocks” can stay the same. I love to choose items that have a variety of textures. Texture alone is a powerful element. I start with my glass coffee table; so it’s clean modern, smooth and elegant. Then I add the thick cotton rustic farmhouse runner (with a nubby natural-looking texture). 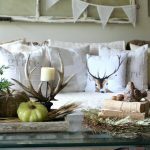 On top I add a large reclaimed wood farmhouse tray, a natural twig nest, old books, gold pine cones, lit candles….you get the point. Everything has a different, interesting, and unique texture. It’s important when arranging to have a variety of heights for interest. I like at least 3 different levels of heights or more. For the sake of my family who watches television over this coffee table I am always considerate, and I don’t go so high that it will have to be moved. You will also want to consider height for conversations. Sit in the seats and look where your guests will look to make sure faces (or televisions view) will not be blocked by your creation. 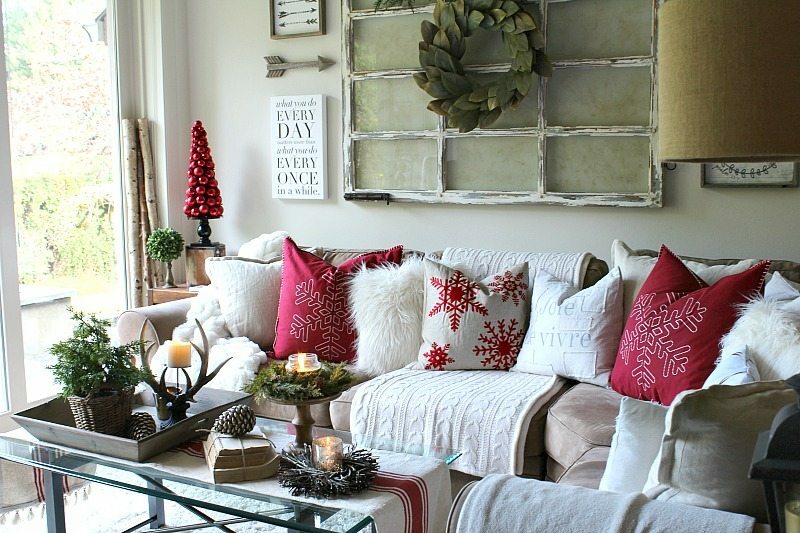 Most of you have probably heard this decorating “rule” before: Decorate with 3 or an odd number. As much as I avoid rules in my decorating I have to agree with this one. An odd number is almost always a better choice. Using three items creates a pyramid. I like to arrange things in triangles. I do this naturally without even thinking about it. Occasionally a straight line of 3 items is fun, but this is usually in a stand alone spot, like a shelf or a tray. If you look at the picture below you’ll see I’ve arranged a triangle of items in the farmhouse tray and also a triangle of 3 on the table runner. I didn’t even think about this…after years of decorating my eyes tell me this feels balanced. Again, it’s not a rule, just a guideline to help you. Now, it’s time to join our next fabulous Blogger on our Blog Hop Coffee Table Tour, Amy of Crazy Chic Design. We know you are going to love what she has created. All our amazing friends have wonderful ideas that you will not want to miss. Enjoy! 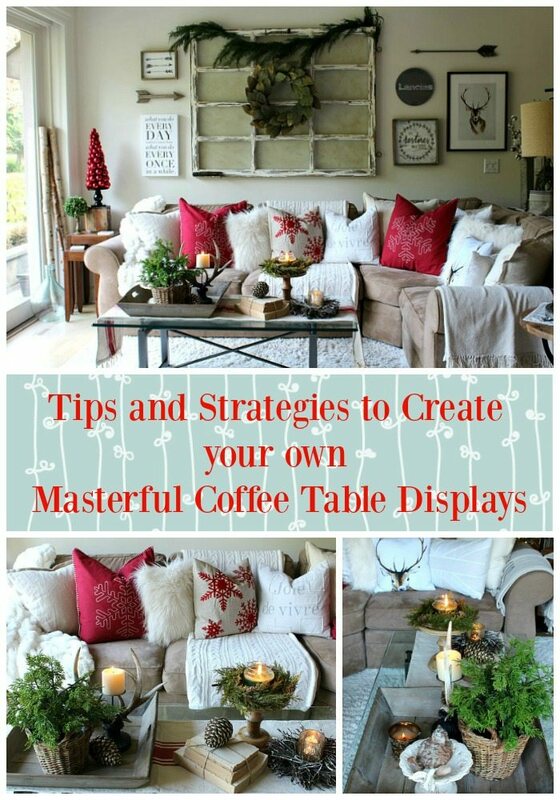 No matter what your style or what the season use these tips and strategies to create your own masterful coffee table displays! Love this! 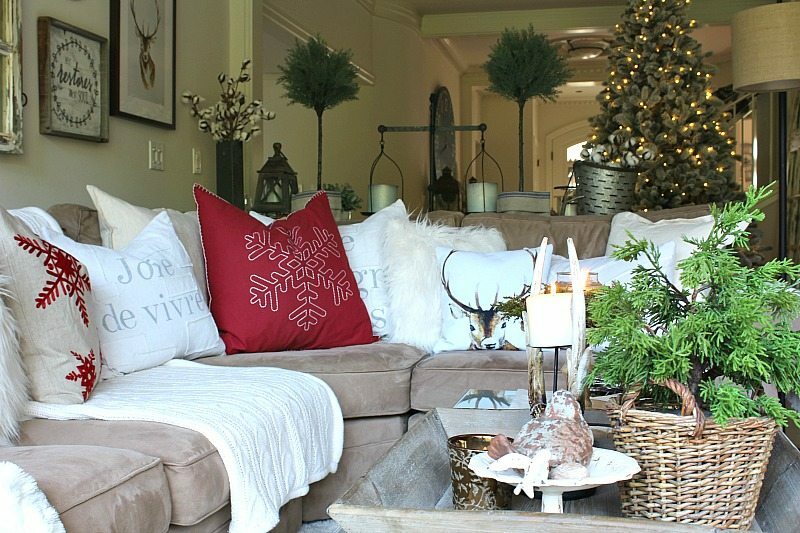 I am not at the stage of life yet where I am hosting holidays but want to incorporate these ideas into my home for myself and my soon-to-be hubby! Jodie & Julie this is fabulous! This coffee table is beautifully arranged. I love the natural elements mixed with the glam. You ladies are amazing and inspirational in all your designs! Oh, I just love all the textures you have combined here! So interesting and eye-catching! And such a happy, friendly space. 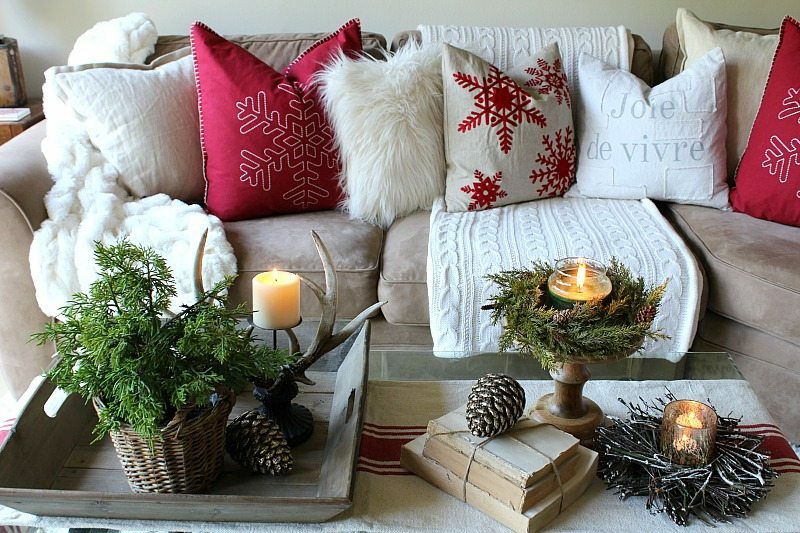 Love that holiday coffee table – you nailed it, my friends! Kathleen, Thank you so much for the visit and for your kind words! When someone you admire so much approves, it really is so rewarding! Thanks again! We’re so happy to hear that you enjoyed the post! 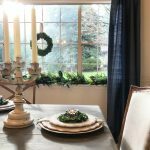 And even more excited to hear that you have been inspired to take some of these ideas and apply them to your holiday decor! Yeah! 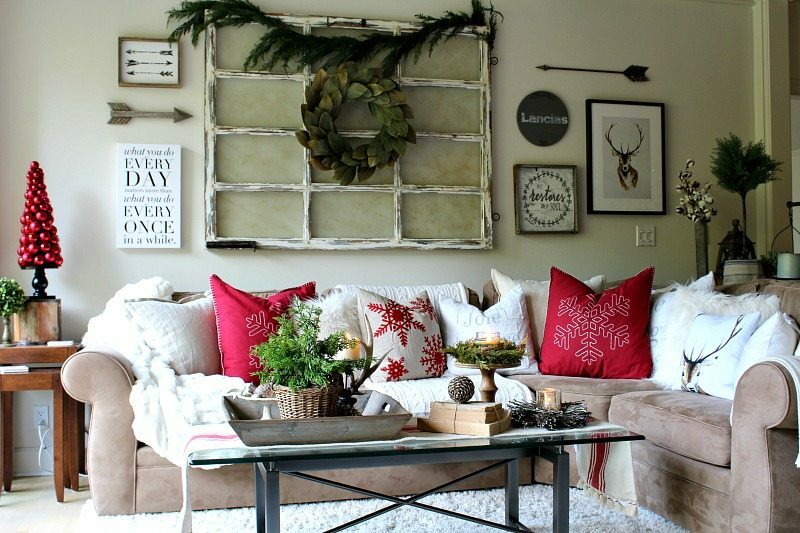 Bravo ladies!…..I love the rustic feel you added to your coffee table …. 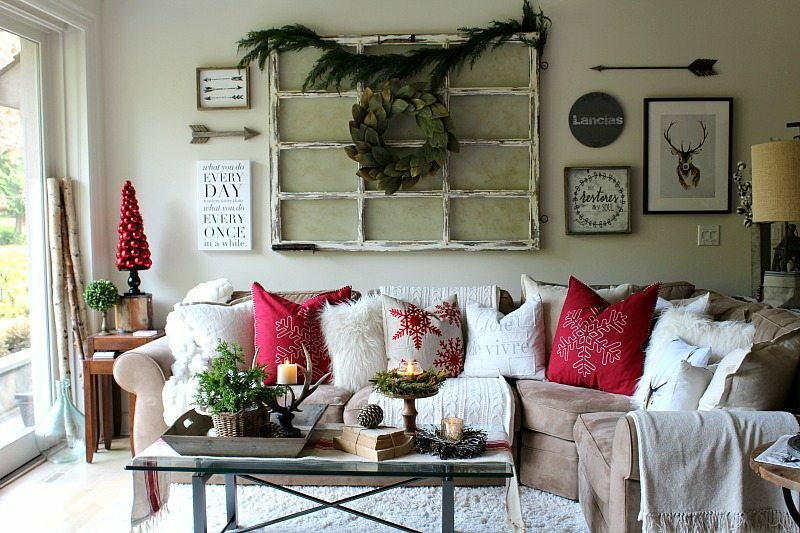 beautifully done!…..and love how you broke it down creating the vignettes. Thank you Honey! You are too sweet! Your opinion means a lot to us, Oh Talented One! We just adore you and feel blessed to be connected both on IG and here now. Thank you for your loving support. Julie/Jodie – Wow!! Have to say it again… Wow! This is beautiful beyond words and I love how you structure your post by giving a quick recap at the end. Bravo… Well done and so much to take from it. Bravo! Aw, thank you so much Susana! We really appreciate that! We tend to be quite wordy, haha, so a recap at the end is pretty key! Thank you for taking the time to stop by and leave such a sweet comment. 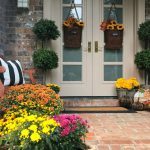 We are honored to be connected on our fun blog hop series. Such a gorgeous coffee table. I just want to come on over and have a cup of tea with you! I love all your elements on your table. Just like you, I could stare and did at your table! Your ideas are spot on and so helpful to your readers! Aw Janine, you are too too kind. Seriously, you have been an Angel sent from Heaven to bless our lives. Jodie and I are so grateful to count you among our true friends. If blogging and IG brought us nothing else YOU are worth it. Thank you for your generosity of spirit that is so contagious. Sheila, Thank you so much. Isn’t it so much fun to see all the different styles? Each time I see your table I want to start over completely. haha. I need like 5 houses so I can decorate in all the styles I love! Thank you, Sweetie, for taking the time to read our blog and to reply. It means so much to us to have your kind support. Lily, We are so grateful to you for stopping by our blog and also for your kind reply. We hope you took away some useful ideas from this post. We also hope you will stop by often and say hello. If you ever have any questions or requests feel free. We are here to help. In the meantime have a wonderful holiday season! I love reading all your tips! This provides so much inspiration! Well hello there Monique! Welcome to our blog! We are sincerely grateful for your taking the time to read and leave a kind reply. It means so much to us. 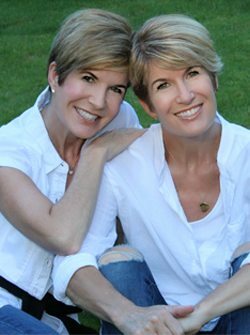 Jodie and I are having a ball so far on our blog, and sharing it with kind people such as yourself really make it all worthwhile. We hope you will return often, and that this is the beginning of a sweet friendship. Dear Sam, Thank you SO much for taking the time to read and of course leave the kindest reply! You are a gift that keeps on giving. We look forward to our growing friendship and shared inspiration. Your coffee table is stunning! I love the way you used the different elements. You ladies are so talented and I couldn’t be happier that you decided to share your knowledge. I learn something each time I read your blog and even when you post on Instagram. I know I’ve said it before, but again, you’re both an inspiration! Thank you for sharing with the rest of us. I really liked the part about the stages and how they are used so that the decorations do not look like they are scattered and disorganized in any way. That is probably why my mom is looking at this long piece of cloth with the reindeer printing the other day. But anyway, this is good to remember though I think, for this year, we will need someone to redecorate for us. After all, we will be out of the country until a week before Christmas. We are so glad you found this post helpful! Thank you for the sweet comments and hope to see you on the blog in the future!